The first Saturday in May usually marks the biggest horse racing weekend of the year with the all too famous Kentucky Derby. It all started way back in 1875 when a well-fortuned traveler from Kentucky was inspired to, like many of our traditions; bring some European culture back home with him. From the roots of the Epsom Derby in England and the Grand Prix de Paris in France, we get the Kentucky Derby in none other than Kentucky. 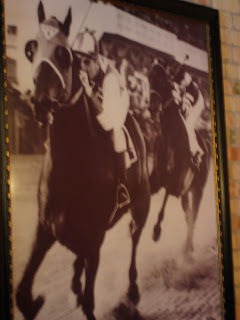 The Derby takes place at Churchill Downs. It is the first of the three races that provide the opportunity to gain the honor of the Triple Crown. The other two races are the Preakness in Maryland and the Belmont in New York. A horse must win all three to obtain the title. The horse race itself only lasts for about two minutes, so don't blink, or you might miss it. Also, it's good to note that there are multiple races to watch throughout the day. The big one to watch is the last race. That's the one where they adorn the horse and jockey with the Garland of Roses. Another interesting tidbit is that the race horses are actually only 3-years old. Imagine trying to run a race at such a young age. As the horses get older, they retire at the ripe old age of six. Multiply that by decades and that would still be considered early for us humans - shucks. Though, really that means that the horses only get three or four chances to win it big. Good luck, and try not to foil it up since there aren't too many chances. Yikes, the pressure. Maybe I'll stick with my 9-5. As for us spectators that go to the track, or enjoy the race on the tube, the stress factor can play in on a different level. Almost every person watching the race has some sort of bet or monetary obligation tied to the winner. As if your heart isn't beating fast enough just from the excitement, then you tie it to your personal piggy bank. For that, we tend to overindulge in the traditional spirits to calm the nerves on whether your horse wins or losses. Another mint julep, please.